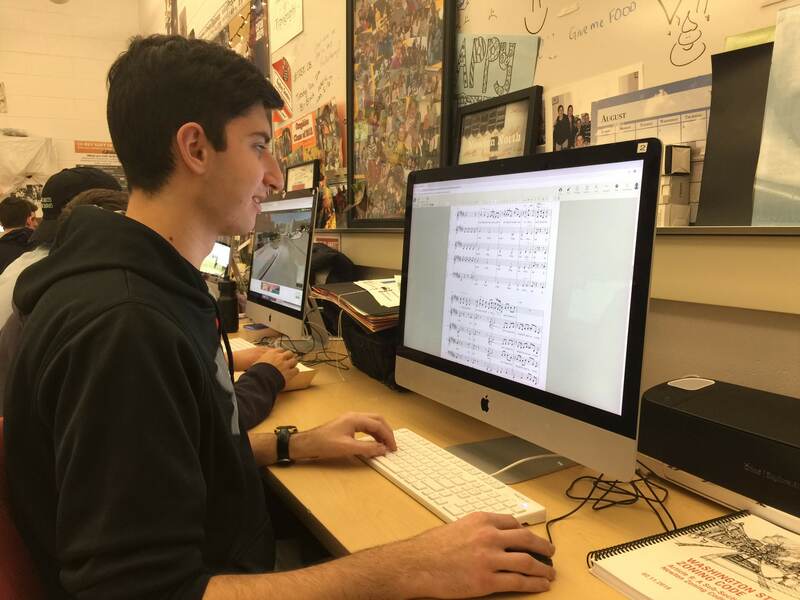 Senior Ben Gobler, co-director of the Melocotones a capella group, arranges music in the graphic communications room Friday, March 8. Guest writer senior Ben Gobler, a co-director of the Melocotones a capella group shares his tips and tricks for arranging music. 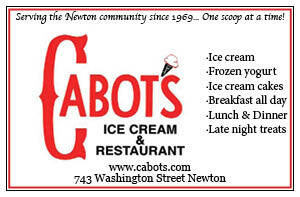 Be sure to check out The Newtonite’s profile on him in our recent print special! Copies are available in room 273 or the Main Office. Step 1: Choose a song. A good song for a capella should be catchy, singable, and recreatable. Remember that a song by your favorite band may not be the best candidate for a capella. Some songs get their best qualities from their instruments, and it’s important not to force a song into a capella if that’s the case. Your arrangement should be an upgrade of the original song, so if you’re having trouble capturing the greatness of the song, then you may want to try another. But don’t fret! Not every arrangement will work out, and that’s okay. There is no shortage of songs out there! The best thing I can recommend is to listen to as much a capella music as possible. You’ll develop a great sense of what works and what doesn’t for styles, song choices, and overall sound. *Pro tip: If you haven’t already, create an online account with a music notation program like Noteflight. The free version will provide you with all of the tools you need to make professional arrangements. It also features playback so you can hear how your score sounds as you work. Step 2: Drop in the basics. You’ll want a foundation to work from later on. Don’t get caught up in the small details when you begin, or else you may never finish! This is when you’ll need to make a choice about lead vocals; sometimes it makes sense for an individual to solo the song while the other voice parts sing backup. Depending on the song or the size of the singing group, though, it can also make sense to give the melody to a whole vocal part. Now that you’ve decided which parts to arrange for, it’s a good time to give the basic chords of the song to the backup parts. If there’s a solo singer, write in the general melody. It’s okay to simplify any vocal riffs or improvised rhythms. If your song could benefit from beatbox, there’s no need to notate all of the percussion; your beatboxer will have their own style, so it’s okay to leave the specifics to them. For the sake of this step, all you need is an outline. *Pro tip: It’s easiest to write your arrangement when you’re working in the same “environment” of the original song. Take a few seconds to look up the Key and Tempo of your song, and match them both in your online score. Once you’ve finished writing the basics, you can transpose (change the key) to fit the vocal ranges of your singers. Step 3: Stylize. This is the most important step of the process. Many arrangements fail here, but it’s easy to do if you know what to look for. Here are my top recommendations. Most importantly, you’ll have to free yourself from the original song. The audience didn’t come to hear a replica of the song, they came to hear your group’s unique arrangements! Remember that a capella singers are not a band, so don’t treat your singers as band instruments — again, the goal isn’t to mimic every instrumental aspect of the song. Try to avoid repeating sections of the song identically in your arrangement, or the audience will lose interest. Groups like Pentatonix are great at mixing things up; vocal parts are taken out, added back in with new riffs, harmonized with the melody, etc. so that each moment in the song is new and engaging. And while you’re working to stray from the original, feel free to cut out parts of the song that are repetitive or just instrumentals. This tip is especially useful in long songs. Another simple trick is to vary the volume or rhythm between verses and choruses to keep them engaging. *Pro tip: Lyrics! Unlike band instruments, background singers can sing words! This may be obvious, but countless arrangements leave their background singers with only oohs, aahs, duns, bums, las, etc. The best way to spice up any arrangement is to give these singers some words: echoing the main lyrics, responding to what’s said in the song, or finding moments for the entire group to join and sing the main lyrics are all ways to give the background singers some personality. Plus, using words in the background makes the song more singable for the performers and the audience when it’s stuck in their heads the next day! People won’t remember the la la las, but they will remember your creatively added background lyrics. Step 4: Cleaning. Now is your chance to make some touch-ups. The most common issue is when parts of the music sound good on the computer but not with voices. Other than the bass, make sure that vocal parts singing in harmony are not spread too far in range. (Low tenor parts clash with the bass, and high soprano parts will overtake the melody.) You want tight harmony! Another cleaning task is to make sure there are no places where every part stops singing, even for a beat. Unless it was intentional, you’ll always want at least one voice singing at all times. *Pro tip: Clean your sheet music, too! Don’t forget all of the good ol’ music notation (slurs, ties, accents, dynamics, accidentals, measure numbers, rehearsal letters, etc.) Sheet music with just notes and nothing else is very difficult for singers to learn from, so take the time to make your sheet music complete and professional.